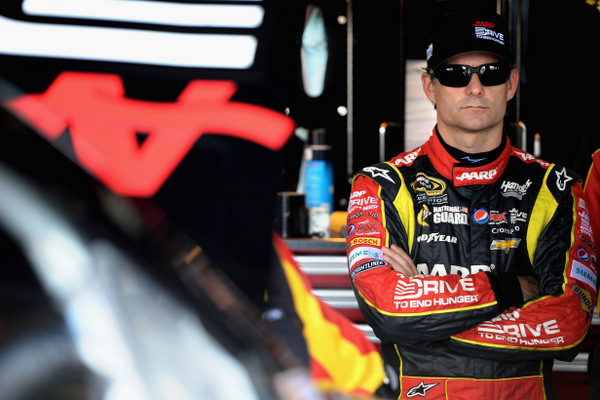 Jeff Gordon, on the verge of missing the playoffs, has one last chance to make the cut, and he's starting out Saturday night's Richmond 400, the final race of NASCAR's regular season, at the head of the field. Gordon set a track record in taking the pole, and he needs to win to be sure of a spot in the chase. He's 11th in the standings, and a win would give him at least a wild card spot. If he doesn't win, he still has an outside shot, because he's only six points out of the top-10 cutoff. Five spots are open, and 10 men are fighting for them. "There are so many story lines you don't know where to begin," Gordon said. "I've made a lot of mistakes this year." Kurt Busch, also on the hot seat in his bid to make the playoffs, is on the front row too, and he, like Gordon, is looking for his first win of the year. He's 10th, right at the cutoff, and he may need to win too to get a spot. Busch just announced two weeks ago that he would be leaving the Barney Visser-Todd Berrier team at the end of the year. But Busch doesn't look like a lame duck. "It's like the bottom of the seventh and we've got a one-run lead," Busch says. Kurt's brother Kyle, already locked into the chase, is a heavy favorite to win here, a track where he has the best finishing average, and during a hot run on the stock car tour. Since late June Kyle Busch has the best record in the series. Gordon, 42, broke a David Pearson record for consecutive seasons winning a pole, now with 21. The pole here provides a driver with a good edge on pit road, which Kurt ruefully noted. "This is a long race, you've got to be smart," Gordon says. But just a week ago at Atlanta a number of big-name drivers didn't alway make the smartest moves, including Gordon and Carl Edwards. Plus, as Kyle Busch noted, the guys already locked into the playoffs can afford to play roughhouse. "Did we make a statement? Yes. But so did Kurt, and so did Brad (Keselowski)," Gordon says. "It's interesting that all these guys on the bubble come in here and really step up. 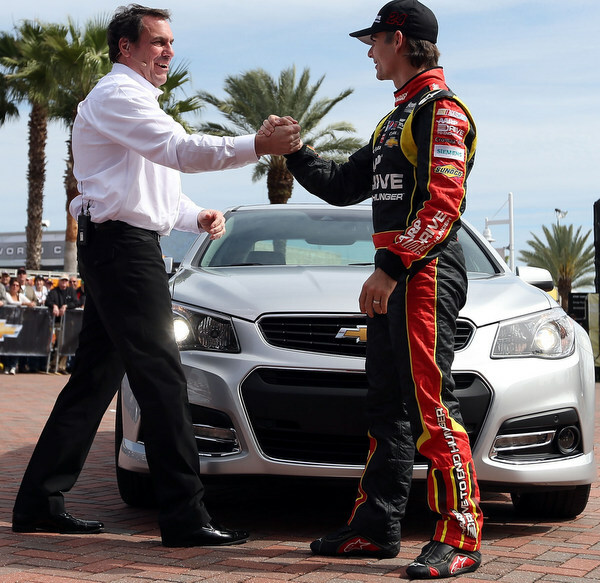 That makes for some talk about what we might expect in the race." On Gordon's shoulders too is the fact that his career is on the backside, and it's not clear how much longer he will run the Cup tour full-time. "We all recognize what is on the line here, who's going to make it," Gordon said. "It does seem people are singling us out (Kurt and Gordon). But, hey, now we qualify 1-2." Well, Jimmie Johnson and Chani took Friday off, and skipped the track, while celebrating the birth of their second daughter, Lydia Norriss. So maybe that explains part of the reason for Johnson's struggles out on the race track the past few weeks. Johnson may yet deliver Team Chevy yet another championship, despite a slump since running second at Indianapolis six weeks ago -- only one top-10, an eighth at Watkins Glen, coupled with a 40th, 36th and 28th the last three weeks. 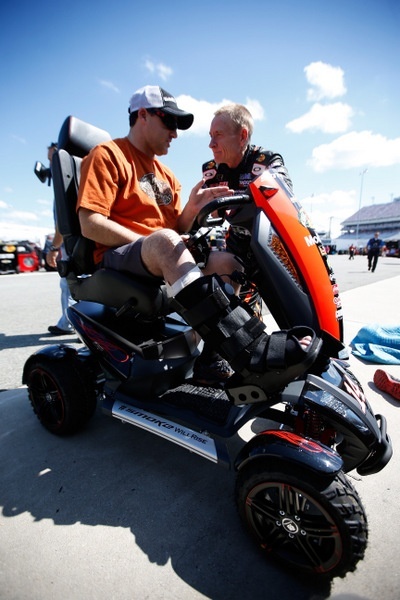 But he'll have to start Saturday night's Richmond 400 (7:30 p.m. ET) from the rear of the field, after missing Friday's qualifying. Regan Smith subbed for Johnson Friday at Richmond International Raceway, posting the 11th quickest laps in opening round practice for crew chief Chad Knaus. Johnson is to run the 400. Smith tested Johnson's car here a few weeks ago, and he was the designated sub. 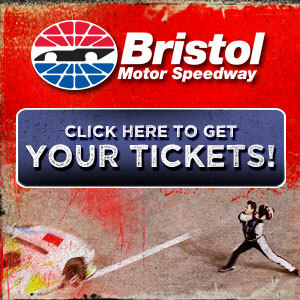 "If we went into Loudon weekend (two weeks hence), we were going to have some difficulty with the schedule," Knaus said. "We were hoping she was going to come this weekend. "It is actually working out better than we had hoped." Johnson's slump has caught everyone's eye of course. Does that mean the five-time champion has lost his edge? Consider that over the last seven years, since 2006, only seven men have finished the season ahead of Johnson. Kyle Busch and teammate Matt Kenseth are considered to have the best shots at upsetting Johnson. Busch says he's shrugging off Johnson's current problems: "You've got to give the credit when credit is due, and certainly Jimmie Johnson's team has shown that they're the ones to respect when you go into the final 10 races, because they've done it before and they've been so close so many times. "I don't think there's been a year that Jimmie hasn't been in contention going into the final two or one races. "You know those are the guys you're going to be dealing with. "There is a switch somewhere over at Hendrick Motorsports they'll flip next week and they'll be just fine in Chicago. I guarantee it." But, hey, over the past nine races -- Atlanta, Bristol, Michigan, Watkins Glen, Pocono, Indianapolis, New Hampshire, Daytona and Kentucky -- Kyle Busch himself has posted by far the best average finishing numbers, an 8.8. Versus Jimmie Johnson's sluggish 15.8 finishing average. "I wouldn't say it's a very good predictor," Busch insists. "Look at Jimmie. He's won at all but maybe one or two chase tracks. "They had a stretch of three bad races; that’'s not indicative at all on how they're going to run. "There's Clint Bowyer: super fast at Atlanta and had an engine problem. I think he's going to be just as fast throughout the chase." Busch, Kenseth and Bowyer all run Toyotas, and Toyota's engine problems over the year have been the subject of much speculation. J. D. Gibbs, who runs the Busch-Kenseth-Denny Hamlin operation, says they've stepped up quality control. Still four Toyotas blew engines at Atlanta. 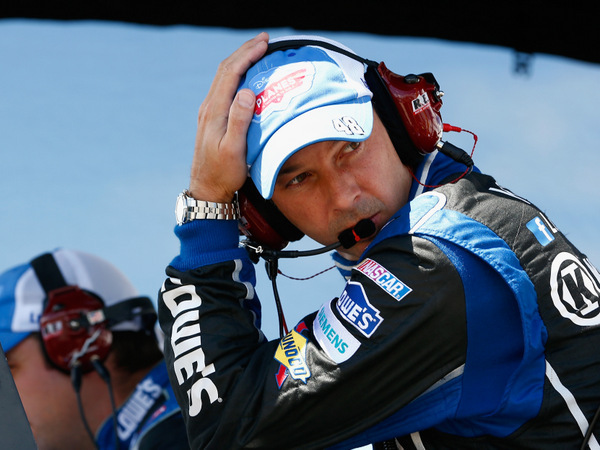 The recent stretch, Knaus concedes, "has been tough. "But our cars have been very fast. At Atlanta we were running well and everything was going to be fine. At Michigan we were clearly very, very fast in both race cars. And at Pocono we were fast. "It's unfortunate we've had these situations. But quite honestly, it's actually helped us, because our team was a little rusty on fixing crashes and repairs." "We've started the chase in a lot of different scenarios. We've started leading the points; we've started 10th in points. We've started chases with DNFs, and been able to come back and run competitively. "So we don't really focus on that stuff as much as everybody else does. We focus on how the team is performing. We focus on what we're capable of doing and how we're going to approach the situation. "And right now we're coming in with our heads high and our shoulders back and ready to go. We feel very confident we've got a great race team and a great driver and good race cars, and we can go out there and race our way into this championship." In a curious twist to Jimmie Johnson's title bid: Chevrolet's John Fitzpatrick, who is marketing manager for performance cars (Camaro/Corvette), says the new Chevy SS that Johnson and the other NASCAR teams are currently racing will only be available to the public in limited numbers, when the street car itself is finally released sometime in December. There are some 3,000 Chevy dealers in the U.S., but only about 900 Chevy SS street cars will be initially offered for sale, Fitzpatrick says. And the company probably won't sell more than 2,000 over the year. The NASCAR SS version has won 10 times this season and leads the NASCAR manufacturers race over Toyota and Ford. The street model will be marketed against the Ford Taurus SHO, The Dodge Charger SRT8, and the Chrysler 300 SRT8. Dodge pulled out of NASCAR last year. Ford races its Fusion model in NASCAR. The Chevy SS is unusual in that it is built in Australia and shipped to the U.S. List is $45,465. Meanwhile the wait continues for NASCAR's 2014 Sprint Cup tour calendar. NASCAR's France family probably won't make any major changes for next season. But the still-missing schedule is prompting speculation about what might be going on backstage. Likely TV has something to do with any changes that might come. For one, the markets for the NASCAR playoffs miss some of the biggest: Los Angeles and New York, two of the most obvious. NASCAR is switching from ESPN/ABC to NBC beginning with the 2015 season. The gist of the report is that SportsCenter spent three-quarters of its coverage on football, basketball and baseball....and NASCAR rated barely two percent of the coverage. The National Hockey League got more coverage.